Systemic risk. I guarantee that most ordinary folks have no idea that if trucks stopped rolling all across America, within a short period of time nearly all Americans would all be in a life-threatening situation from major delivery shortages. 70% of all freight that is moved in the U.S. is done so by truck. You (we) depend on that ‘stuff’ for our survival. A major disruption in truck travel would immediately impact seven major industries, and would bring America to its knees within days due in part to “just in time manufacturing”, zero-inventory, and the fact that our modern way of life is entirely dependent upon unimpeded distribution chains. - Severe shortages within 72 hours, especially of perishable items. - Panic will make shortages worse. - Clean drinking water will run dry (every 7 to 14 days all water treatment plants receive chemicals by truck to make drinking water safe). - Many hospitals operate on a “just in time” delivery for medications and supplies. - Hospital and nursing home food will run out in 24 hours. - Gas station fuel will run out within 24 to 48 hours. An average gas station requires deliveries every 2.4 days. - Airlines and air-cargo will be grounded due to lack of supplies. - Within days, America will be buried in garbage, presenting an enormous health hazard. - Most retailers rely on “just in time” delivery of their products to keep inventories low. - Consumer behavior during emergencies triple the inventory turnover – speeding up the already ‘bad’ situation. - Nearly 100% of manufacturing have switched over to “just in time” processes in order to optimize efficiency and profits. Manufacturing will shut down within hours. - ATM’s and bank cash will run dry very quickly. - Businesses will lose access to cash. - Bank branches will shut down. It’s all pretty scary. The ripple effects would be severe, the specifics of which are far too many to list here. You may be of the opinion that something like this could or would never happen. You would be wrong to think so. A super-spike in the price of diesel fuel due to a major Middle East disaster/war/disruption could grind to a halt much of trucking traffic. 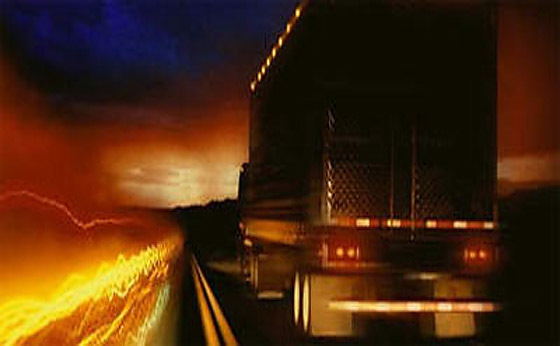 Any major event, terrorist or otherwise, which causes the majority of truckers to remain at home with their families for the sake of their health or security rather than to risk leaving them behind and going out on the road. Think about it. Are you prepared?